Where it all went wrong? Today is the 1st day of National Novel Writing Month. I sat down at my keyboard as soon as I got up, because I’ve been bashing away at this writing thing long enough to know that I work best in the mornings. Waiting to work in the afternoon ruins my whole day–and I don’t get anything done. Because I know that I’m going to be away from my computer and unable to write for a number of days during November, I had a pretty big word goal for today: 2274. That number was auto-calculated by my dear friend Scrivener. Truth be told, word output is not a problem for me–story coherence is. Most of my “writing” time is spent at my desk trying to hack a 9000-word tangle down into a 4000-word capsule that can be swallowed with joy. I have not yet learned to enjoy this part of the process. I call it dying and sobbing, some of you may know it as “revising.” For this reason, I normally track my writing progress by 15-minute timed sessions, a trick I learned from Ashley Pérez. 15 minutes is short enough that I can make myself do it, no matter how argumentative I’m feeling, and long enough that when the timer goes off, I’m involved enough that I’m ready to set it for another 15. But having that little ‘Project Target’ box open today while I wrote was superb. Every keystroke mattered. Just as quick as I typed, the box tallied. Almost immediately, I had made an impact and the bar was being shaded in before my very eyes. As it grew, it changed color! 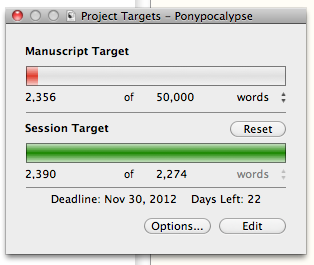 It went from red to orange to yellow, heading for green as I closed in on the word count goal. So magic! That little tangible proof kept me pretty cheerful. I met my word goal shortly after 11 am, and I felt pretty good. Before I closed out of Scrivener and backed it up, I had already realized that I wanted to make changes to the first scene. But I told myself that if I hadn’t written what was already there, I wouldn’t have known what needed to be changed. As Scott Westerfeld and Lynda Barry say, making marks on paper changes your brain. So I made a few quick notes about my new notions and promised myself that I wouldn’t come back to them until December. * I crowed my triumph to my writing buddies on NaNo, Facebook, & Twitter. Then I was free to futz around reading email, looking at catalogs of clothes I’d never wear, and wasting time until lunch. But after lunch, something sinister happened. 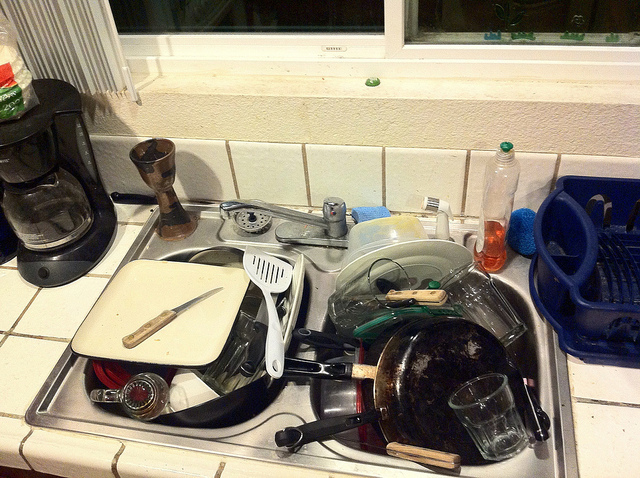 Maybe it was because I had to face a sink full of dishes from last night, or maybe its because–well, I was going to tell you it was something to do with the alignment of the planets, but when I checked my horoscope it was all about baseball and I couldn’t understand it. But I’m sure I can blame Jupiter if I try hard enough. Hands in the soapy water, I started to feel like what I had written was so terrible that it negated any superficial word accumulation. Sure, I could whack out 2000 words in a morning, and sure they followed the outline. Sure I learned new things about my character and walked her through her first big decision. But, gosh, was it lifeless. Rote. Plodding. Not the sort of thing anybody would ever want to READ. But who was it that said a writer is the last person to know whether their work is any good? Tomorrow morning, I’m going to sit down at my computer, whip out that life-saving Dialog Spine, and write another 2274 words. I expect that part of the time I will feel like a rock star, and the other half like a worm. How about you? Did you meet your word goal for Day 1? Do you feel good about it? Is your novel rocking along and you’re really excited? Or are you, too, beset by black doubts? *Rule #1: Never, ever go back and revise the first pages until you’re done. Ever. That way lies the rabid marmot bite of madness. Categories: First novel | Tags: Alisa Alering, Astrology, Doubt, NaNoWriMo, Scrivener, Writing | Permalink. At least you get a clean house!